Editor: This comes from the Palyul Clear Light. It's a magazine from the Nyingma tradition. The introduction and first article in the newsletter are by Khenpo Tsewang Gyatso, someone whom I have been fortunate to receive teachings from several times. In the back of the issue I found this elegant and simple explanation of a basic Tibetan Altar. 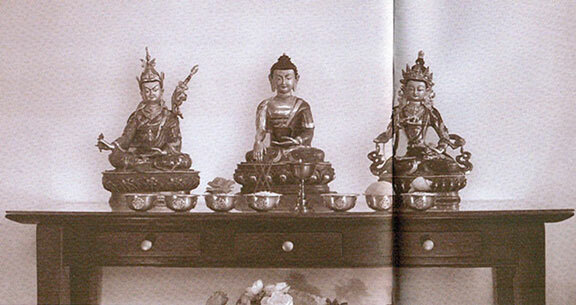 The most basic shrine consists of a statue or picture of a deity or lama elevated above a set of seven offering bowls and one butter lamp. The offering bowls are placed in a straight line along the front of the shrine table, and are spaced apart no more than the length of a grain of rice. Do take care also that the bowls are not too close together or touching; a neat and regular order and spacing is auspicious. A butter lamp, tea light, or decorative electric candle or light is set in the middle of the row of bowls between the fourth and fifth bowl, as the sequence of the offerings represented by the bowls and light are, from left to right: argham, fresh water for drinking; padyam, perfumed water for bathing; pushpe, flowers; dhupe, incense; aloke, light; gendhe, perfume; nevidya, celestial food; and shapda, music. You may offer fresh water daily in all seven of the bowls, along with a fresh light, or you may have physical representations of some of the offerings that would remain on the shrine from day to day. In that case, you would offer water in the first two bowls (argham, padyam); then place fresh, silk or dried flowers in the third (pushpe); sticks of incense in the fourth (dhupe); then your lamp (aloke); then fresh water in the fifth bowl (gendhe); a torma or piece of fruit or candy in the sixth (nevidya); and finally a shell to represent sound or music in the seventh bowl. The permanent offerings should be placed on a bed of rice or semi-precious stones in their respective bowls. When opening the shrine in the morning, with the intention that all beings may benefit from your generosity and with the view that all the Buddhas and holy beings are indeed present, fill the bowls from left to right with fresh water. Try to fill them evenly, neither too full, at different levels, nor too empty. Pour the water in an even stream while reciting the dedication prayer shown below. Mentally make your offerings as vast, pure, perfect, and delightful as you can. After filling the bowls, you offer a butter lamp or tea light and a stick of incense. The shrine should be closed every evening. Close the shrine by emptying the bowls from right to left. No verse is necessary here. Water from the bowls should not be poured down the drain or dumped out where people walk. It may be used to water plants or simply poured out on clean ground. Then the bowls are dried with a clean cloth kept for that purpose and placed upside down in their places on the shrine. Your shrine may be much more elaborate than this, with vajra and bell placed on the same level as the statues, and with tormas and other ritual objects. Ask a lama for help in properly organizing your shrine and try to make it as clean and beautiful as your means allow. I dedicate it all to the enlightenment of all beings!